The original idea for this post was something akin to Ashley's dating her husband series. I'd write some kind words about my dear husband and the relaxing evening we shared. It was a really lovely and romantic idea. 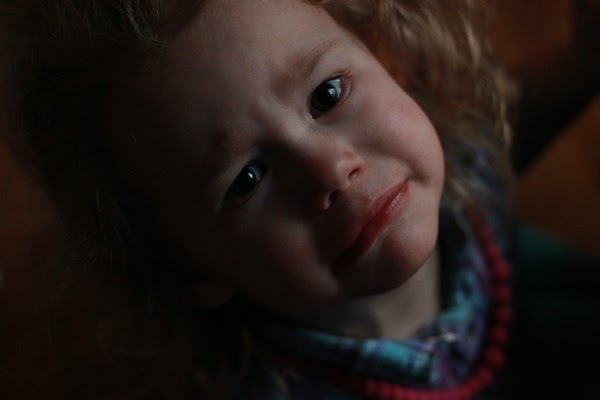 There was a rug in our front yard, I had chocolate frosting all over my shirt, Ella was crying about something (we still have no idea after asking repeatedly), my husband snapped at me because I hadn't given him enough time to vacuum the floors (its his thing), and the Brussels sprouts were burning. This was our date night. My husband works a lot. We are lucky if we get to have one meal as a family together during the week, luckier still if we get to have a Friday or Saturday night together. I'm not complaining - I'm happy to have a husband who works really hard (and likes it) and all that provides our family is incredible. It just means that we've been approximately 127.5 days without a proper date. It also means that when my husband has a day off - there are about 2,700 projects that I want to get done on that one day. This is totally doable and not insane. This Sunday was one of those days. Sundays are also the day when I shoot all the photography for Stir & Scribble or any freelance recipes I'm working on. Usually I'm shooting two full recipes plus two tips in a 2 hour window between nap time and losing daylight. This is also totally doable and not at all insane. Did I also mention that we have a toddler? What is that saying "the days are long but the years are short"? Our days are very very short right now. 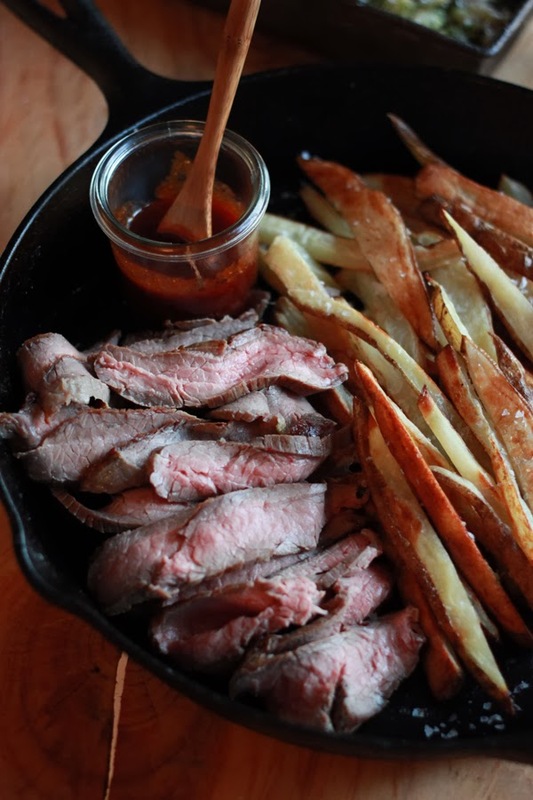 I want to celebrate our little family in small ways more often - so I created this little riff on one of my husband's favorite meals - Steak Frites. 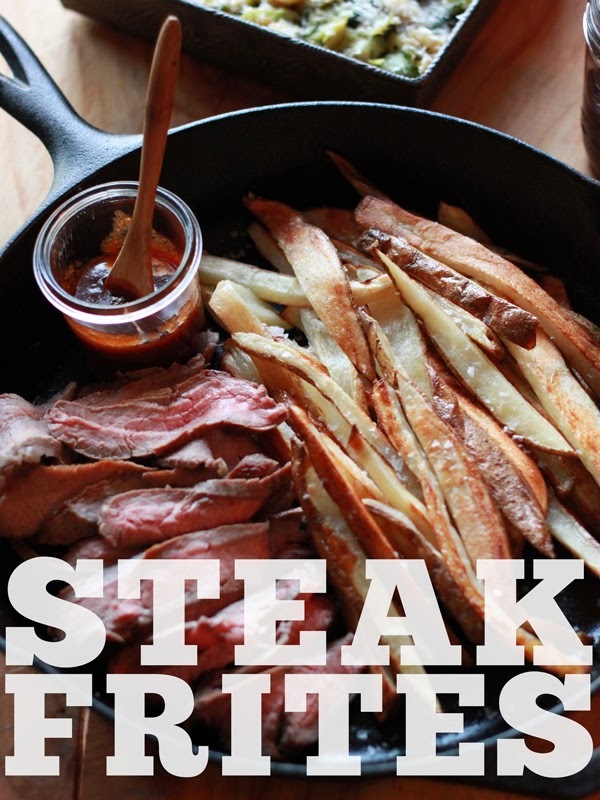 Typically Steak Frites, steak and fries, is a served as rib-eye steak with deep-fried shoe string potatoes. If you think I have the time to prepare either of those - please re-read above. No, instead I bought a flank steak which is rather inexpensive and cooks very quickly and paired it with our new favorite oven fries. And because we are working on eating fewer processed foods - I also made steak sauce; My husband loves the stuff. The beauty of this meal is that it kind of cooks itself. Sure there are a few prep steps - but most of them can be started and forgotten; The same cannot be said for the Brussels sprouts. Combine all of the ingredients in a sauce and bring to a boil over medium-high heat. Simmer for 30 minutes stirring occasionally. 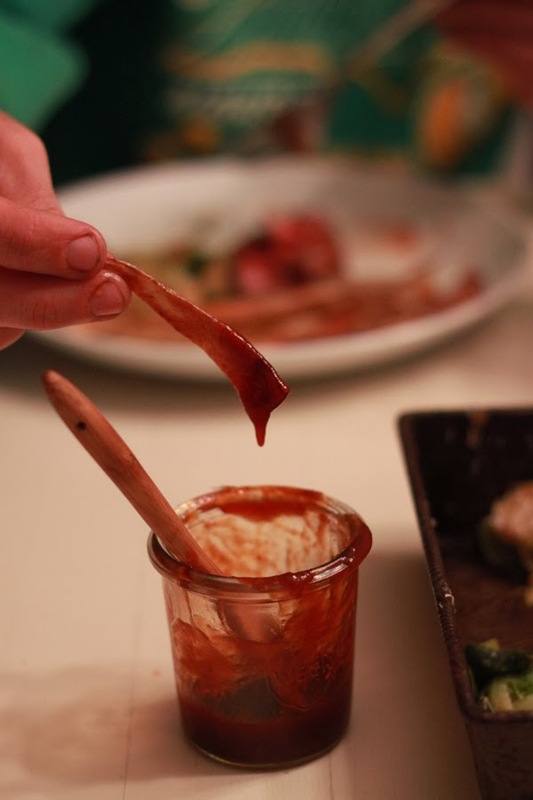 Cool the steak sauce for 30 minutes, strain out the onion and garlic and store in an airtight container in the fridge. Remove the steak from the refrigerator at least 1 hour before cooking. 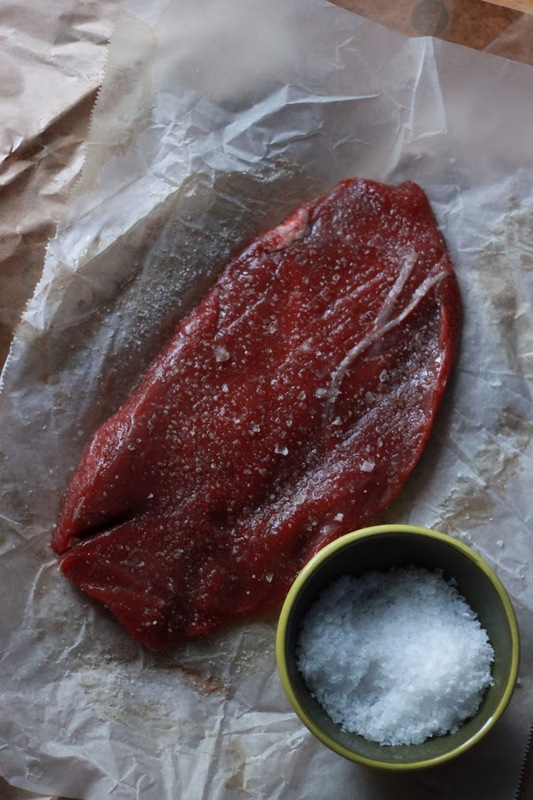 Salt liberally, I used about 2 teaspoons for my 11/4 pound steak, and set at room temperature. Cut the potatoes into 1/4 inch thick matchsticks and cover in cold water. Heat the oven to 400 degrees F. Soak the potatoes for at least 30 minutes. It takes my oven about this long the heat up. Drain the potatoes and pat them dry with paper towels. Spread the potatoes into a single layer on a baking pan and coat with the oil. Bake 30 to 35 minutes or until golden - flipping them once about half way through. Heat a large cast iron pan on high heat. When the pan is ripping hot - sear the steak for 2-3 minutes on one side then flip and sear for another 2-3 minutes on the second side. Remove the pan from the heat and cook the steak an additional 5 to 10 minutes (to desired doneness - I cook mine for an additional 5 minutes for medium rare). Wrap the flank steak in foil and rest for 15 minutes. Slice the steak against the grain and serve with juices from the foil, the fries and steak sauce. GURLLL!! Those are too legit to quit... I know you husband was happy.. He was a super happy camper - especially after he got to finish vacuuming the floors (yah - this is super weird). Looks delicious and I think this would make a great weeknight dinner. Any night dinner - its so quick! Lesley - thank you so much. Its wonderful to have friends who actually really understand what this kind of crazy ambitious life is like coupled with being a wife and mama. Balance is just out the window. I imagine when I get to where I want to be professionally - you'll already be there waiting! When you say "remove the pan from the heat and cook an additional 5 minutes" do you mean cook using the residual heat of the cast iron pan? Yes - I do mean use the residual heat - I will note that in the recipe. Thank you!